What does Creation have to do with Christmas? Last week, my wife and I had the experience of becoming grandparents for the first time when our daughter gave birth! And it was nearly as awesome as becoming parents! In fact, in many ways it was a more precious experience – love upon love, I guess – as we rejoiced not only for our new granddaughter but for our daughter and her husband as well! With Christmas, we celebrate how the awesome Creator came as one of the most humble and helpless among us – a miracle of the very creation He established. What parent or grandparent hasn’t been touched at the birth of their children, peering in awe at their perfect little fingers and toes?! God is a God of wonders. He is a God of living treasures – of intricate beauties and magnificent glories! He is both Creator and Redeemer. “In the beginning God created the heaven and the earth” (Genesis 1:1). This wonderful iconic statement – opening the Bible with the truth of creation – is mirrored later in Scripture with the near-equally iconic statement of the deity of Christ and of His Incarnation: “In the beginning was the Word, and the Word was with God and the Word was God … all things were made through Him … and the Word was made flesh, and dwelt among us …” (John 1:1,3,14). Notice, before God gave us Himself, He gave us sunshine and flowers and fresh air and birds and sunsets over lakes and hills. He gave us smiles and friendships and children and babies – and He then gave us baby Jesus to touch our hearts in a most profound way! The birth of a baby is indeed a marvelous event of creation! And the birth of the baby Jesus, God the Son – in especially humble circumstances – is a stroke of communicating genius by our great Creator! It breaks through both the rebellious pride and the estrangement human beings feel toward their Maker because it breaks into our reality in a most intimate and beautifully touching way. Christmas will soon be here, and we’ve got the perfect gift suggestion! Read on to find out about this brand new DVD that’s yours when you support our ministry! Yes, it’s “that most wonderful time of the year” again as the world catches some of the joy and spirit-of-giving and love that God has for us on this most celebrated of Christian holidays. At Christmastime, it is good to review the full meaning of the incarnation. You see, the baby in the manger is indeed much more. He’s the King of kings and Lord of lords! He’s the Alpha and the Omega! And He’s the unifying principle of science! We have written here previously, for example, about how the most elementary particles of materials are essentially pure energy … and how it remains a mystery that like-charged sub-atomic particles hold together with so much power within the nucleus of the atom. Yet, the Bible speaks of this long before mankind knew much about protons and electrons! As it says in Hebrews 1:1, “God … has in these last days spoken to us by His Son … through whom also He made the worlds, who being the brightness of His glory and the express image of His person, and upholding all things by the word of His power …” No wonder the glory of the Lord shone round about the shepherds on the hills outside Bethlehem at the birth of Jesus, and the multitude of angelic hosts praised God and proclaimed “Glory to God in the highest, and on earth peace, good will toward men” (Luke 2:14). Christmas is a good time to bask in the wonder of creation and marvel at the love and fellowship and beauty of spiritual goodness which is at the root of all things created – much as parents and grandparents bask in the wonder of the children God gives us. But we need to remember we are in a spiritual battle – and one of the greatest weapons of the enemy is the theory of evolution! Evolution not only forms a basis for materialist worldviews, but for new age and pantheist worldviews and all kinds of false philosophy which have been so common throughout history and are so prevalent and popular today. The Bible refers to Satan as “…the great dragon … which deceiveth the whole world” (Revelation 12:9). Thus, deceptive tactics, lies and deceiving spirits are common to this world. And spiritual weaponry must be brought to bear to “overcome” them – including God’s Word and truth and prayer through our Savior who came at Christmas. The message of Christmas is that our great Creator who gave us so many beautiful and wonderful things has already joined us in His creation to give us what we most desperately need. The Word became flesh. God became one of us so that we could be drawn to God. The truth is this: God is with us! The lie, justified by evolution, is that God is NOT! Please help us stand for His truth and expose this great lie! We thank you so much for your prayers and your giving. May God bless you and your family this Christmas, and may He hold you and your family in the palm of His hand always! P.S. It’s here at last! 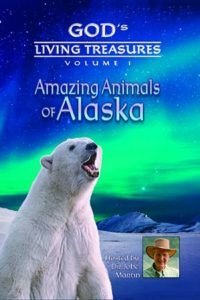 Jobe Martin’s newest DVD – Amazing Animals of Alaska! Get set for adventure as you and your family join this former evolutionist and his friends on an hour-long expedition to Alaska. Enjoy the breathtaking views of God’s coolest creatures and learn incredible facts about their unique traits. Dr. Martin is joined by guest speakers Buddy Davis, Dr. Jim Johnson and Micah Bowman, who share how God’s living treasures show the unmistakable mark of God’s design. This, the very first DVD in Dr. Martin’s new God’s Living Treasures series, features an appearance by Agee the polar bear and 10 other amazing creatures, including the Arctic ground squirrel, moose, red fox, sea otter, wolf and more. Plus, there’s a segment by David Rives on the stunning aurora borealis. I will be happy to send you Amazing Animals of Alaska for a tax-deductible donation of only $40 or more. Plus, I will send to you our very latest CD of Creation Moments broadcasts. Simply click here to make your donation online or call us toll-free at 1-800-422-4253 during regular office hours … and I will rush these items to you in time for Christmas giving. If you wish to make an online donation for less than $40 and receive our very latest CD of Creation Moments broadcasts, please click here. Thank you, God bless you, and may you and your family have a blessed Christmas! © 2018 Creation Moments All rights reserved.